The summer is winding down and it’s time to start thinking about closing the pool for the season. 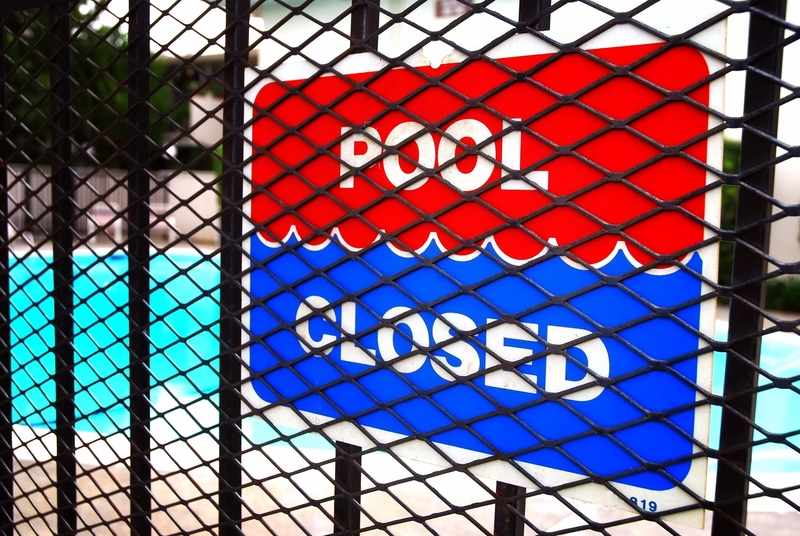 Many pool owners see this as a large inconvenience and consider not closing the pool at all. There are also many pool owners who try to close their pool without the knowledge of how to do it correctly. Let’s look at what can go wrong if you improperly close your pool this year. One of the most important reasons why closing the pool properly is necessary is the deterioration that a pool can go through. Pools have the potential to become affected by freeze/thaw damage. This occurs when water in the lines or behind the pool shell freezes and thaws repeatedly with the potential to develop a crack and a leak. If lines are not blown out and plugged, water can freeze in those lines and crack. Water can also get behind the shell through cracked or missing expansion joints, tiles and coping. When this happens, tiles and coping can become loose, hollow and become cracked and/or fall off entirely. Also, the water level in the pool needs to be maintained below the skimmers. You want to keep water in the pool to maintain the surface. With a plaster or gunite pool, if you remove all the water, you risk the pool succumbing to hydrostatic pressure and popping out of the ground. This will cause damage to the shell and all the lines. It is actually more expensive to remove a “popped” pool than to put in a new one. Liner pools need to maintain water in them to prevent liners from floating. 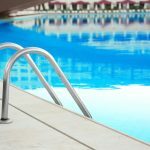 Every year, a pool should be given a thorough inspection by a professional at closing (as well as opening.) This will prepare you for any repairs or upgrades you may want to do in the spring. Proper winterization will help to prevent any new damage from occurring and help reduce your costs in the long run. Then when spring rolls around and you can actually swim, you can plan ahead for upgrades and avoid costly repairs as result of improper winterization, which will delay and shorten your swimming season. Maintaining your water chemistry is also important in the winter. You want to maintain a sanitizer level in your pool to help prevent against algae developing. It is also recommended to keep your pH on the higher or scaling side to accommodate for the acid rain (snow) that will get into your pool. The acid rain will bring your pH levels down over the winter. You always want to make sure that your calcium level is in range. If your calcium level is too low, it will seek it elsewhere which is typically through the pool surface, which can cause deterioration of the plaster or paint. 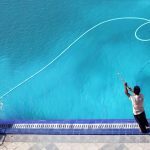 Aside from an algae infested pool being an eyesore, removing the algae and cleaning the pool is requires a lot of time which can be expensive come spring. A safety cover is a good choice for all in-ground pools for winter. This cover prevents leaves and debris from getting into the pool, affecting your water chemistry and staining your surface. It also acts as a barrier to access for animals, and/or people (particularly children) who may run across your cover in the winter. When it snows, the pool is often forgotten. Without a cover that is securely in place with springs like a safety cover, should someone or something run across a tarp you are using to just cover in your pool, they will become trapped (and possibly) injured in your pool. The safety cover in place will bring you peace of mind for the protection of your pool and anyone who may enter your yard. One of the reasons people close their pools improperly is because they underestimate how complex the process is. 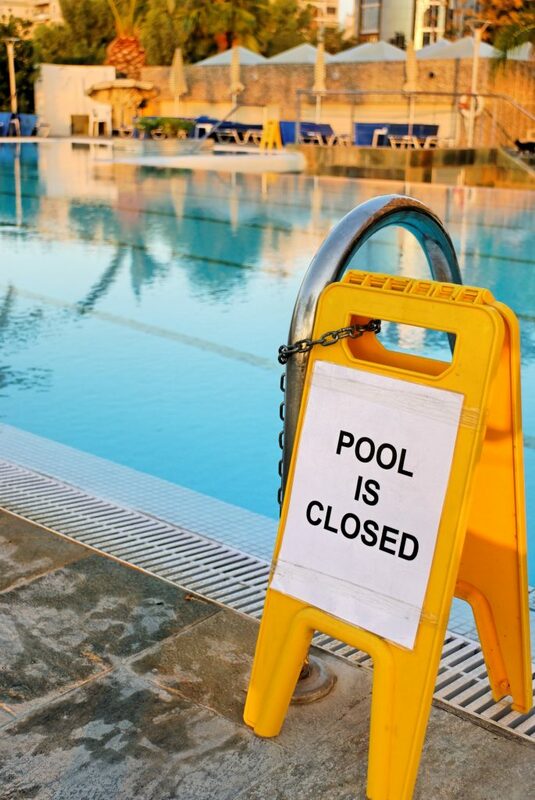 By attempting to close a pool without the proper training, you create extra work expenses in repairs. By trying your luck at closing your pool by yourself, you could be opening up a can of worms of costly repairs. Starting to realize that closing the pool isn’t so simple? Why not allow the professionals to take care of it? Pool Operation Management are trained and certified to inspect and close both residential and commercial pools. We also offer award winning CPO certification courses to teach you how to close a pool properly. Don’t let your pool fall apart this winter, contact us and we’ll take care of the rest.